What is an Alpaca you ask? Alpacas are a member of the camelid family and come from South America. They are close relatives to camels, llamas, vicunas, and guanacos. They are so close they can inter breed! 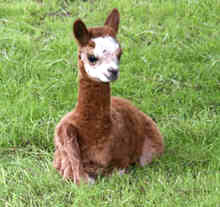 There are two types of alpacas the Huacaya (wa-kai-a) is the most common type of Alpaca. The fleece is dense and highly crimped. It stands straight off of the body much like a sheep and the Suri (sur-ry) which has a longer staple length is straighter with less crimp. It is extremely soft and lustrous. 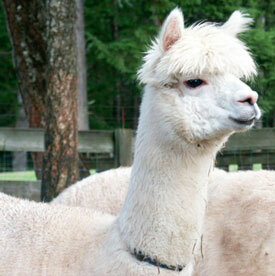 Alpacas weigh 110-170 pounds and stand about 34-38 inches tall at the shoulders. They have a cria (baby) once a year with a long gestation period of approximately eleven months give or take a month. Twins are extremely rare. One interesting thing about birthing alpacas is that generally the births happen during the day around lunchtime give or take four hours. Like cows, they are a ruminant but have one stomach with three compartments and love to chew their cud. One can graze up to eight animals per acre of good pasture because of their soft padded feet, making them gentle on their pastures. How do I care for an Alpaca? Alpacas are extremely easy keepers with no special dietary requirements. 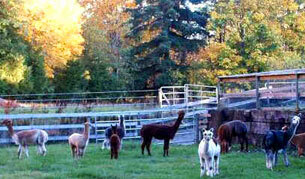 Generally, feed is estimated at a rate of one square bale of good quality hay per Alpaca per month during the winter. In the spring and summer they graze but should also have free choice hay at all times. You can also feed them grain or alpaca pellets once or twice a day along with a mineral lick and always good clean water from a sanitary source. There is no need to groom or bath alpacas but they do need a toenail clipping now and again. They should get their annual inoculations, and be de-wormed. Once a year one shears their Alpacas much like sheep. You can shear them your self but I prefer to get the shearer out for that job. You can expect to get any were from five to twenty pounds of fleece from a single animal. Cleaning up after your alpaca is so easy and their manure is like gold for the garden. Alpacas share a communal dung pile and their droppings can go directly on to the garden much like rabbit pelts do. You will be very popular with your gardening friends and neighbors. Alpacas are a herd animal and can not be kept by them selves, you must have at least two animals. Alpacas are mostly raised for their fiber which we call fleece not wool. Their fleece is three times warmer and seven times stronger than wool. Their fiber is softer than the finest wool and has a higher tensile strength. These wonderful animals have only been in Canada for a little over a decade and the fiber industry is a fledgling one. One can sell the raw fleeces to the mills, fiber co-op or spinners. One can have it processed and made into yarn for knitting or weaving. Make other things such as rugs, blankets, felting and even tickling for quilts. Have the alpaca sent to a mill and made into incredible cloth so you can sew with the cloth. The list is endless you can go as far as your imagination wants. If you want to have easy animals to farm who will give you so much back, alpacas are for you! They are such gentle creatures giving one feelings of peace and tranquility.